This is month 5 of The Year Of Buying Nothing. Inspired by An Exacting Life, I’ve now been tracking our grocery spending via spreadsheet for four months. It is past time to give you an update. I wrote about it initially here. Each item we purchase gets a line. Aldi gives each of their items a 4-6 digit number which appears on the receipt, that makes life SO easy for us. We’ve had to make up our own numbers for the Coles items. After 4 months of shopping, I can now say how many lines we buy from each of these stores. 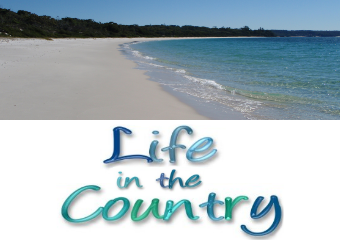 It is far less than I imagined it would be, especially from Coles. It is important to note that this number is constantly changing – each shop may add up to 10 new items at Aldi or 3-4 at Coles. Also we keep note of identical items and the price we paid for those. When an item is the same brand just a different size, that gets a new line, eg Manning Valley eggs account for 3 Coles line items because they are available in 3 different sizes (600g, 700g, 800g) at 3 different prices. Of the 55 items we buy from Coles, 9 of these are non-food eg patty pans, deodorant when it was on super special, or baking paper in a size we cannot buy at Aldi. I can now state that 16 of the items are “junk” foods. When I say that I specifically mean highly processed bad foods that we really should not eat like “twisties” and “french fries”. Some of those are items I personally do not eat, like Cinnamon Doughnuts. The Other Half likes those, it is his fortnightly treat, some of them go to work with him the days after we shop which gives me a couple of days to bake his cinnamon muffins or his from-scratch low sodium biscuits. 2 of the line items from Coles are potatoes when they were cheaper at Coles. 4 of the line items from Coles are tea or coffee related. 2 of the line items are chicken treats – yoghurt and mealworms. 3 of the line items are Manning Valley eggs. Of the 143 items, 18 are non food eg deodorant, shampoo, toilet roll, tissues, even reed diffusers. Aldi make a fantastic reed diffuser FYI – we love the coconut and mango one, it smells amazing. Only 14 of the 143 items are things I would consider to be “junk” foods. 32 of the line items are fresh fruits and vegetables. 18 items are dairy eg cheese, butter, cream. 8 of the items are meat/chicken/fish. Each week before we shop, I create the new pages for that shopping trip. Each shop at each store gets a page in the spreadsheet. It is fairly simple – you have to copy the blank spreadsheet page and give it a new name. But I have from time to time messed it up and left it on move instead of copy. Lesson has been learned, I am very strict about selecting copy now! 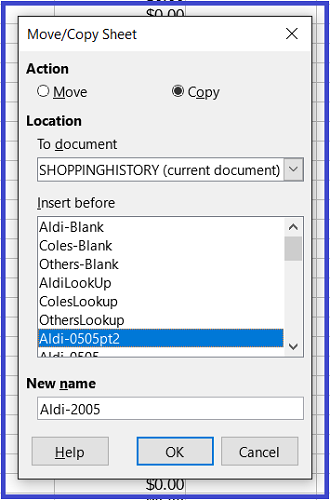 Once we have done the shopping, I sit down with the receipt and enter in all the item numbers first, when I hit enter it pulls the description from the lookup sheet then goes to the next line so I can put in the next item number. Once all the items have been entered, I move across and add in the prices, then the quantities. 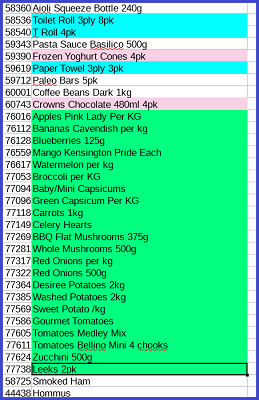 Most of the time the quantity will be 1, but in cases where it is $ per kg, I enter the amount purchased and the spreadsheet does the maths for me. When I’m done listing the items we purchased, I add in the CC surcharge in and make sure the total amount matches the receipt. I have the Coles Mastercard and thus anything I spend earns me flybuys points. It does add up over the course of the year, so that is the main card I use now. 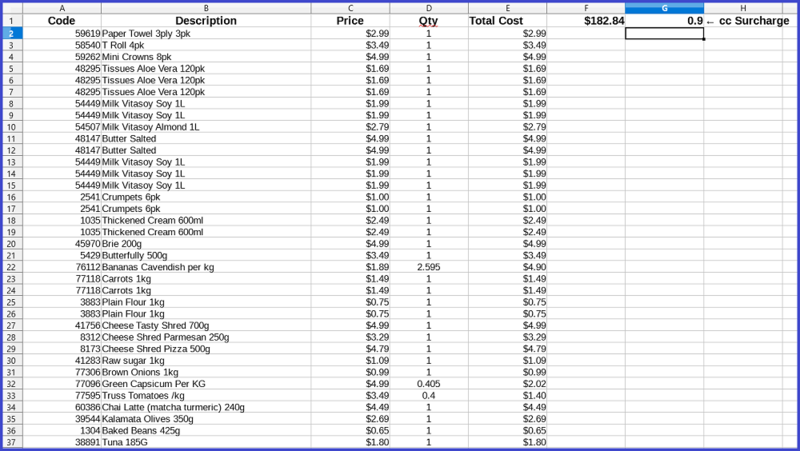 The Coles spreadsheet is slightly different – as I do not get charged a surcharge for credit card there, we have added a field where I can minus the $10 flybuys discount we use from time to time. This will allow me to track when we do this and how much it saves us over the course of the year. How Does This Spreadsheet Help Me? 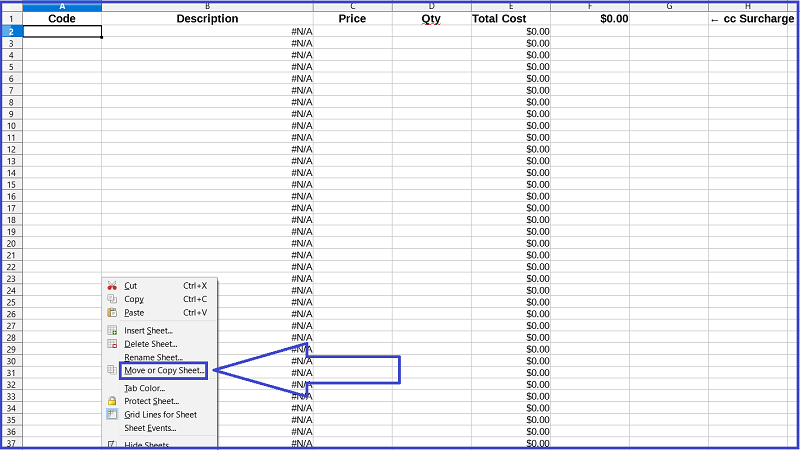 I am more familiar with the pricing of items overall thanks to this spreadsheet. That is mainly because I am the one entering all the data. We were out at dinner recently and someone was talking about an item and I was able to name what we last paid for it off the top of my head. That event taught me to stand in a particular spot and watch as we check out, so I can spot any mis-keys and prevent us buying 2.5kg of red capsicum when I purposely chose green because it was cheaper, or accidental double ups like above. We are far more conscious about how much we buy and how much we use. We have a good idea of the base number of items we need each fortnight so that we do not run out of essentials like milk or toilet paper. There is less food wastage than ever before in our kitchen. Part of that is due to freezing more items – in particular mushrooms. We are better able to purchase items on special and bulk process and freeze them. Last fortnight I bought 2kg of mushrooms on special at $3.99, part cooked them and froze 7 packets, which will give me 7 weeks of pizza mushrooms. If they are on special again in the meantime, I will buy more and process them. In the meantime I can enjoy not having to buy them for $4.99. This spreadsheet has been extremely useful for us and I cannot imagine we would stop doing this. The Spreadsheet Maestro has already begun creating useful ways to look at the data we are collecting. At the end of the year we will have a lot of data to play with and it will be interesting to see exactly where our grocery shopping dollar goes. Aldi keep adding more products to their range meaning we have less to buy at Coles – just recently they added lactose free yoghurt. It would be fantastic to be able to do all our shopping in one place, however I think the reality will always be as it is now, most of the shop at Aldi with just a few items from Coles. 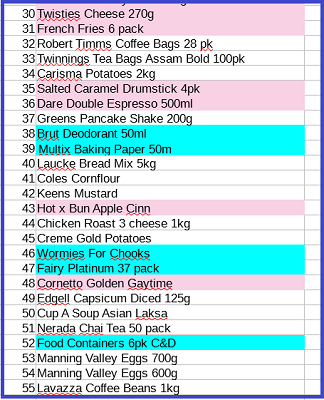 If you would like a copy of the spreadsheet with all the Aldi line items let me know in the comments and I will email it to you. I will take out all the Coles data and also all our shops. Thanks for the link! Your system is brilliant and I see you get lots of usable information from it to inform your shopping. There is nothing like being confronted with hard data on junk food purchases. I love that wormies are on there, haha! I have a new spreadsheet this year and I will be posting about it in July for the first 6 months of the year. I really wish I could be this organized!